If you were a super hero, what would your super powers be? As Rotarians, we have MANY super powers! We are The Eradicators, eradicating polio from the face of the planet. We are the Fearless Super Readers, bringing literacy to youth everywhere. We are H20 Masters, bringing water to the farthest reaches of the world. We are Professor Peace, advocating for local, national, and global solutions. 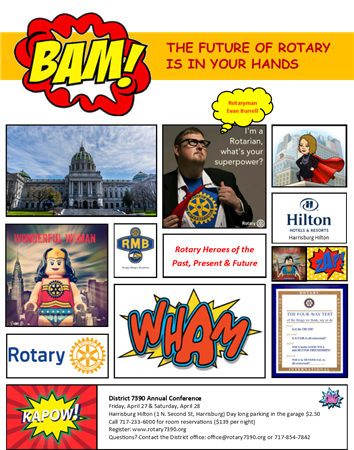 The Rotary District 7390 Conference will celebrate many super heroes of our past, present, and future. Meet Super Rotarian, Evan Burrell, who is making a difference by leaps and bounds! Meet local Rotarians whose efforts seem to go beyond the boundaries of mere mortal accomplishments. David Morrison, Director of Historic Harrisburg Association and member of the Rotary Club of Harrisburg, will narrate an historical bus tour around the City of Harrisburg. His insights will certainly enlighten all who participate! Tracy Pawelski, Senior Communications Counsel of Harrisburg based PPO&S, will overview her recent pilgrimage on the Camino de Santiago (a 500 mile walking journey across Spain) and how we, as Rotarians, can benefit from her observations and insights. Tracy’s pilgrimage was seeded through her daughter’s experience as a Rotary Youth Exchange Student in Spain. The Presidents of four Young Professional Organizations have agreed to serve on a panel to overview their thoughts on addressing community needs; how to engage with young professionals; and how our clubs can work together with Young Professional Organizations toward common goals. We have invited local and state elected officials… the finalists of the Four Way Test Speech contest will share their presentations; and Rotary Means Business will present the first ever Opportunity Summit as part of the conference. PLUS ~ wear your finest super hero costumes to the Saturday night festivities for fun and prizes! 8:30 - 9:30 a.m. Remembering Heroes from our Past with John Harris Jr.